1. Historical Landmarks: early efforts by Galileo, Halley, Mayer, Herschel, Argelander, Struve, Kapteyn, van Rhijn, Shapley, Hubble, Lindblad, Oort, Trumpler, Baade, Reber. 2. Current View of the Galaxy: disk, bulge & halo constituents and dimensions, distance to the Galactic centre, metallicity gradient, population types, evidence for origin. 3. Stellar Reference Frames: precession, meridian telescopes and position measures, proper motions from fundamental catalogues (FK3, FK4, FK5, Hipparcos), proper motions with respect to galaxies, relative proper motions for open clusters and membership probabilities. 4. Stellar Parallaxes: relative and absolute parallax, refractors versus astrometric reflectors, luminosity calibrations based on parallax data, statistical corrections for parallax bias, errors in parallax, Hipparcos and HST measures, remaining uncertainties. 5. Stellar Radial Velocities: spectrograph systems for radial velocities, heliocentric corrections, measuring errors as functions of spectral type and dispersion, problems caused by telescope flexure, lines used, rotation, emission, line asymmetries, etc., radial velocity scanners, Griffin-type, CORAVEL, atmospheric calibrations, limitations. 6. 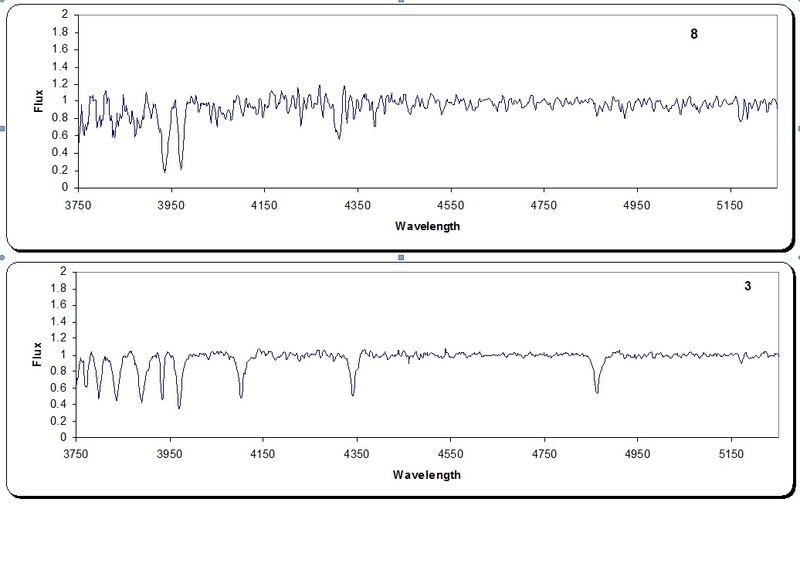 Spectral Classification: review of astrophysical basis for tying visible spectral features to stellar parameters, MK system, roles of temperature, gravity, chemical composition, rotation, companions, etc., designations for the various different types of stars encountered in astronomical studies, peculiar stars. 7. Photometric Systems: photometry as a substitute for spectroscopy, broad-band systems (UBV), intermediate-band systems (uvby), narrow-band systems (H-line), Balmer jump sensitivity, the role of extinction corrections and interstellar reddening, temperature and abundance influences, favourites: Walraven system, Strömgren system, DDO system, H-beta photometry, K-line photometry, khg photometry, etc. 8. Interstellar Reddening: intrinsic colours for stars and the reddening curve, reddening slope variations in the galactic plane, techniques for determining R = AV/EB-V, anomalies. 9. Absolute Magnitude Calibrations: statistical and secular parallaxes, trigonometric parallaxes, moving cluster parallax and ZAMS fitting, Upton's modification for cluster shrinkage or expansion, ZAMS construction, H-line equivalent width calibrations, Ca II K-line reversal. 10. Basics of Stellar Evolution: nuclear processes, convective and radiative energy transport, high mass stars and low mass stars, pre-main-sequence and post-main-sequence stages, core sizes, Schönberg-Chandrasekhar limit, isothermal cores, changing from static, spherically-symmetric models to realist models, rotation, overshooting, mixing. 11. Open Clusters, Globular Clusters & Associations: cluster CMDs, metallicity, open cluster designations, globular clusters and their characteristics, OB associations, R & T associations, nomenclature, catalogues, Elmegreen & Lada mechanism for progressive star formation. 12. Star Count Analysis: star counts as functions of magnitude, cumulative star counts, treatment of interstellar absorption, Olber's paradox, observed characteristics of star counts in the Galaxy, Gould's Belt, fundamental equation of star count analysis, general solutions and restricted solutions. 13. Stellar Density Functions: m-log π tables, numerical solutions, the Local System, Wolf diagrams and dark cloud distances, Herbst-Sawyer technique, star density variations perpendicular to the Galactic plane, Z scale heights for different stellar types. 14. Luminosity Function: Kapteyn's studies, general techniques of deriving the luminosity function, mean parallaxes, trigonometric parallaxes, spectroscopic parallaxes, mean absolute magnitudes from proper motions (Luyten's technique), variations in the general luminosity function for different populations, initial luminosity (Saltpeter) function, initial mass function and star clusters. 15. Chemical Composition of the Galaxy: halo, bulge & disk metallicities. 16. Solar Motion: fundamental standard of rest, local standard of rest, solar motion from proper motions and radial velocities, dynamical versus kinematical solutions, the drift term, observational effects, standard solar motion, basic solar motion, solar motion relative to the dynamical LSR, correction for drift, methods of calculating the local circular velocity. 17. Statistical Parallaxes and Secular Parallaxes: upsilon and tau components of proper motions, method of secular parallax (upsilon components), method of statistical parallax (tau components and radial velocities), applications, restrictions, recent results for RR Lyrae stars. 18. Kinematic Groups: velocity ellipsoid, vertex deviations for different stellar types, moving groups, high velocity stars and their percentages among common stellar types. 19. Galactic Rotation: general formula for galactic rotation, Oort's formulae and the A & B constants, the AR0 relation, recent determinations of the local rotation constants, A, B, R0, θ0. 20. Galactic Structure Studies: 21-cm line data and analysis, rotational velocity curves for the Galaxy and other galaxies, flat rotation curves, the Galactic warp and the Magellanic Stream, locations of spiral arm edges, use of molecular line and radio continuum studies, optical tracers and local spiral arm structure, nomenclature for local spiral arm features. 21. Propagation of Spiral Arm Patterns: spiral density-wave theory, resonances, preference for two-armed spirals, evidence in the vertex deviation of the velocity ellipsoid and streaming motions along spiral arms, stochastic self-propagating star formation, "feathery" features in spiral galaxies, importance of DW versus SSPSF modes. 22. Galactic Dynamics: force law perpendicular to the Galactic plane, simplifications and method of determination, local space density and the missing mass problem, runaway stars inside and outside the Galactic plane, formation from supernovae and star cluster evolution, presence near OB associations, initial Z velocities, WR and OB runaways, recent studies.